538,000 tons to be exact. As you can see in today’s chart, technology is leading the charge in lithium demand. 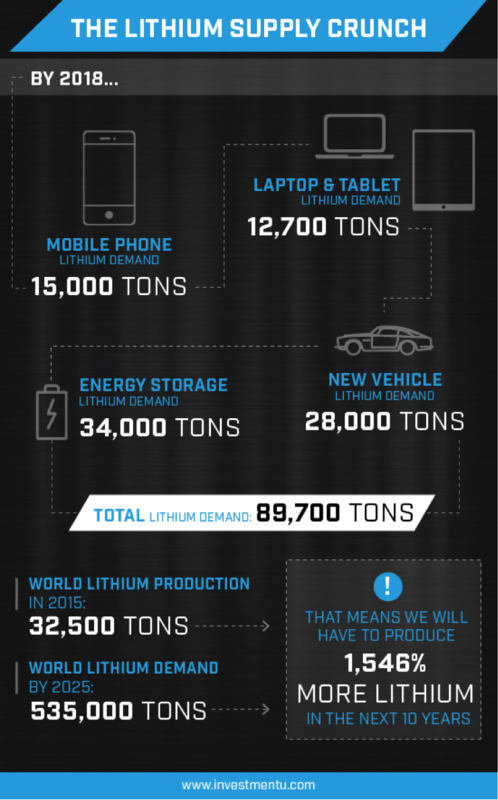 By 2018, mobile phone manufacturers will require 15 million tons of lithium. The world’s 407 million laptops and tablets will need 12,700 tons. And 500,000 new vehicles will use up 28,000 tons. The energy storage industry will trim another 34,000 tons off of our lithium supply. We’ll need to produce 1,500% more lithium over the coming years. As surging demand outpaces limited supply, prices will soar. What does [increasing demand] do to prices? Here comes another earth-shaking KA-BOOM! In China, a major user of the metal, the price of battery-grade lithium has surged to more than $20,000 per ton from just $7,000 per ton in 2015, according to a report from CRU Group. Prices will zig-zag up and down from here. But the big trend is higher. 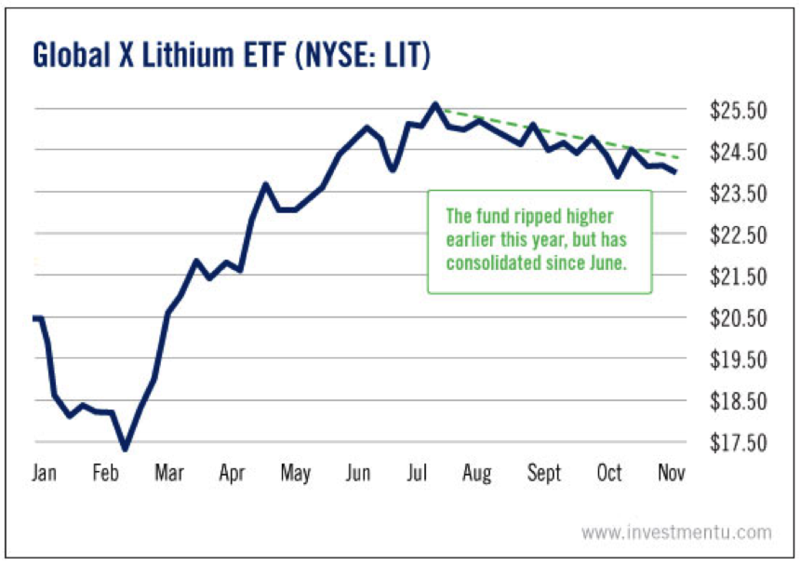 According to Sean, one way to play the trend is with the Global X Lithium ETF (NYSE: LIT). This fund holds lithium producers, explorers and miners. That includes FMC Corp. (NYSE: FMC), Sociedad Química y Minera De Chile SA (NYSE: SQM) and China’s LG Chem. Lithium is riding a surge of rising global demand. And with more and more of our devices relying on this powerful metal, the rally is just getting started. Get ahead of it by adding lithium plays to your energy portfolio today. P.S. Sean recently uncovered a $3 stock that could jump to $27 because of the lithium supply crunch. To learn more about this company, click here now.